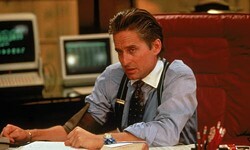 SLICK: Michael Douglas won the Best Actor Oscar for his performance in Wall Street. KILLERS (2010). In Killers, Ashton Kutcher plays a seasoned CIA assassin, which is only slightly more believable than Miley Cyrus portraying Scarlett O'Hara or David Spade tackling General Douglas MacArthur. His character, Spencer Aimes, is tired of his bloody lot in life, though, so after he meets the sheltered Jen Kornfeldt (Katherine Heigl), he quits the hitman biz and marries her, never bothering to tell her about his dubious profession. Cut to three years later, where we find the pair living in petrified bliss — that is, until his past comes back with a vengeance. The idea of a suburban setting as a front for illicit activity is fairly original, and this could have made for a sharp satire. Instead, everyone blows their assignment. The ham-fisted direction is by Robert Luketic, who previously teamed with Heigl on the worst film of 2009, The Ugly Truth. The forced banter between the stars comes courtesy of scripters Bob DeRosa and Ted Griffin, who apparently never met a dreadful line of dialogue they didn't like. Yet reserve the main brickbats for Heigl, who once again uses variations on her single, solitary, thespian expression (wide-eyed wonder) to play the only role she ever tackles in movies: the annoying, neurotic pill whose ill-placed air of superiority can't disguise the fact that she's an intolerant nincompoop. 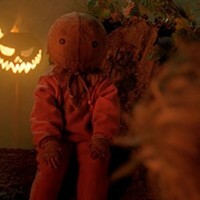 DVD extras include an 11-minute making-of piece and 12 deleted, alternate and extended scenes totaling 5 minutes. LETTERS TO JULIET (2010). This immediately tips its hand that it's going to be a formulaic romantic comedy straight off the assembly line — nothing more, nothing less. Sophie (Amanda Seyfried) heads to Italy for a pre-wedding honeymoon, a chance to spend some quality time with her fiancé (Gael Garcia Bernal) before they get married. But it's apparent from the start that he's 100% prime jerk, begging the question, "Why is someone like Sophie engaged to him in the first place?" Answer: Because giving Sophie a decent boyfriend, someone worth keeping, might cause audience members to feel uncomfortable when she later starts dallying with another man. It's better to saddle her with an obvious loser so viewers don't have to clutter their minds with moral quandaries. The rest of the picture is just as bland, with Sophie unearthing a 50-year-old love letter and attempting to unite the British woman (Vanessa Redgrave) who wrote it with her Italian suitor (Franco Nero). Naturally, Claire has a grandson Sophie's age, and just as naturally, this lad (dull-as-dirt Christopher Egan) and Claire bicker incessantly before falling in love. Predictable? Let's just say this is the sort of movie where if a character is shown climbing up some shrubbery, you just know a branch will break and send him tumbling earthward. DVD extras include audio commentary by Seyfried and director Gary Winick; a 13-minute making-of featurette; and 10 minutes of deleted and extended scenes. ONE FLEW OVER THE CUCKOO'S NEST (1975) / WALL STREET (1987) / SOLITARY MAN (2010). Here's a prime example of that age-old adage, "Like father, like son." Kirk Douglas (still hanging in there at 93) enjoyed a rich and varied Hollywood career, yet he's been matched step for step by his son Michael. 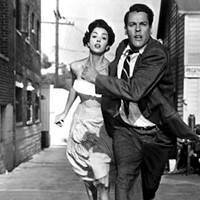 Although known primarily as actors, both have also earned plenty of ink for other contributions to the film industry. 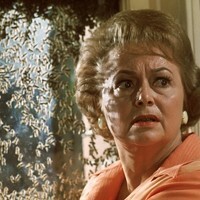 Kirk, for instance, helped break the odious blacklist by insisting that persecuted Dalton Trumbo be given screen credit for scripting Spartacus. Michael, for his part, has served as producer on a dozen films, a career choice that won him an Oscar on his first try in that capacity. Interestingly, Ken Kesey's novel One Flew Over the Cuckoo's Nest was first brought to Michael's attention by Kirk, who had appeared in a short-lived Broadway version back in the 1960s and had tried without luck to transfer it to the screen for years. Michael met with more success: Nabbing Saul Zaentz as co-producer, Milos Forman as director and Jack Nicholson as star, he turned out an enduring American classic, as well as one of only three films — It Happened One Night and The Silence of the Lambs are the others — to win all five major Academy Awards (Picture, Director, Actor, Actress and Adapted Screenplay). 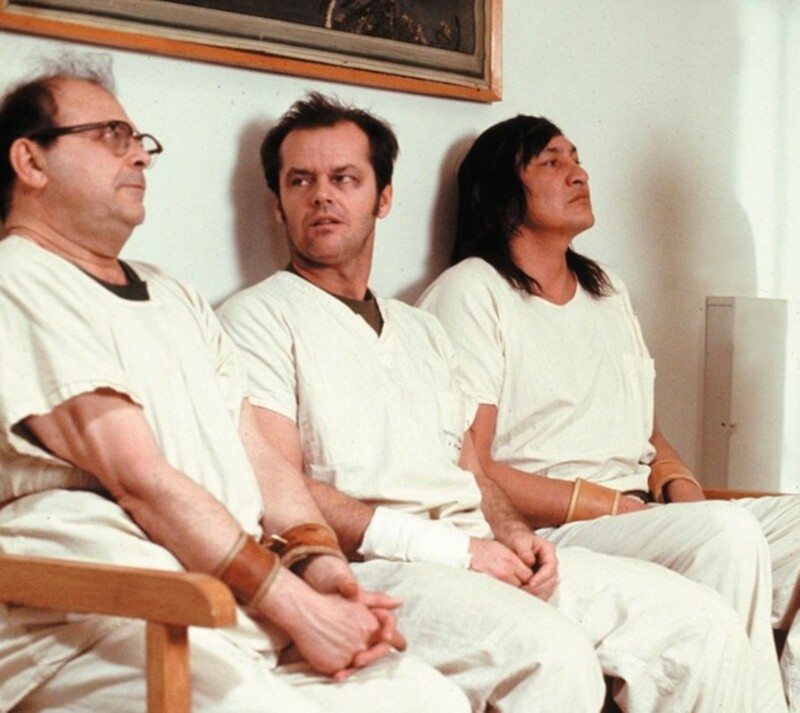 Nicholson is sensational as Randle McMurphy, a live wire who fakes mental illness and ends up in an institution, where he matches wits against the dictatorial Nurse Ratched (Louise Fletcher, a limited actress landing the role of a lifetime). Equally superb as a comedy, a drama and a social critique, the picture sports the added treat of boasting a wide variety of soon-to-be familiar faces in the supporting ranks, among them Danny De Vito, Christopher Lloyd, Scatman Crothers, Brad Dourif (in an Oscar-nominated turn as stuttering Billy Bibbit) and Will Sampson (memorable as the hulking yet sensitive Chief Bromden). Dropping out of his co-starring role on TV's The Streets of San Francisco in the same year that he took home his producing Oscar, Douglas spent the next decade appearing in as many flops (Running, It's My Turn) as hits (The China Syndrome, Romancing the Stone). But 1987 proved to be the year that cemented his stardom, thanks to back-to-back turns in the box office smash Fatal Attraction and Oliver Stone's Wall Street, for which Douglas won the Best Actor Oscar. Stone's first film since his across-the-board success Platoon may have performed softer with critics and audiences than anticipated, but if nothing else, it's now considered a time capsule of Reagan-era avarice, with Douglas' corporate raider Gordon Gekko uttering the instantly classic catchphrase, "Greed, for lack of a better word, is good." And with American capitalism now uglier than ever before, it's no surprise that Stone and Douglas are returning this week with the sequel Wall Street: Money Never Sleeps. Douglas' standing as an A-list actor may have slipped over the course of the past decade, but 2010 is shaping up to be a decent one for his resume. In addition to the Wall Street sequel, this year has also found him headlining the indie flick Solitary Man. In his best performance since 2000's Wonder Boys, he stars as Ben Kalmen, a formerly successful car dealer whose life has hit rock bottom — all because of his own failings. Trying to get his career back in order after being caught cooking the books, Ben spends more time chasing after young women than anything else. His ex-wife (Susan Sarandon) is coolly distant; his new girlfriend (Mary-Louise Parker) supports him until he's discovered to be sleeping with her college-age daughter (Imogen Poots); his own grown daughter (Jenna Fischer) tries to understand him; and a naive college freshman (Jesse Eisenberg) hopes to learn from him. The film's knotty relationships and crisp dialogue are surpassed only by Douglas' captivating turn as a troubled heel whose pathetic behavior fools no one, least of all himself. Extras on the 35th Anniversary Ultimate Collector's Edition of One Flew Over the Cuckoo's Nest include audio commentary by Douglas, Zaentz and Forman; the 87-minute making-of documentary Completely Cuckoo; and 13 minutes of deleted scenes. The lavish set also contains a 52-page commemorative book; a deck of cards featuring the cast members; four international mini-posters; character photos; and a reproduction of the original press book. Extras on Wall Street include audio commentary by Stone; an optional, full-length trivia track; a 2-minute conversation with Stone and his actors; and a 12-minute piece on the two Wall Street films. Extras on Solitary Man include audio commentary by writer-director Brian Koppelman, director David Levien and actor Douglas McGrath; a 12-minute making-of piece; and the theatrical trailer.